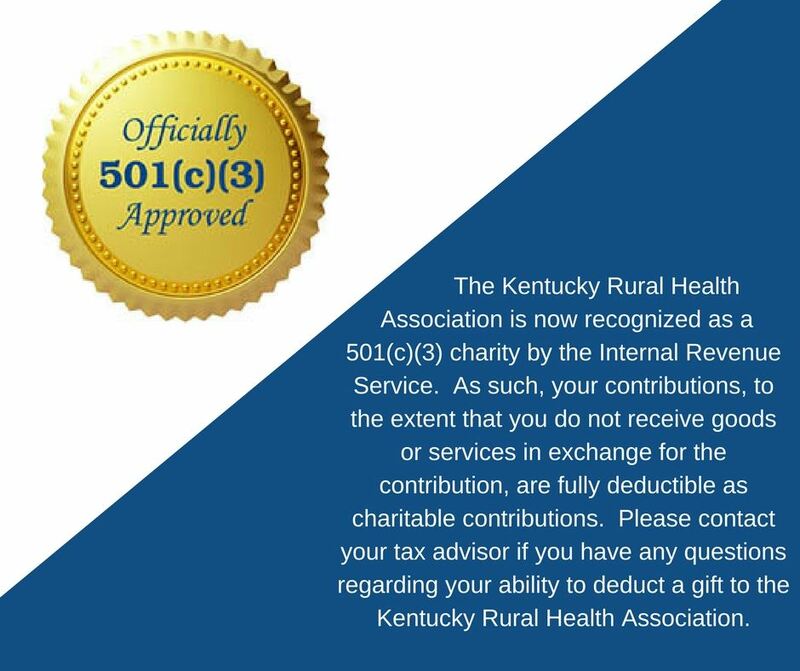 KRHA executive director, Tina McCormick says that "The Kentucky rural health association has been a 501c6 non profit since its inception. We are excited to change our status to a 501c3 in order to better serve all Kentuckians. Our mission is improving the health of Kentuckians through education and advocacy and we feel this change in our non profit status will allow our outreach to grow while obtaining additional funding to support those goals". This will be possible because contributions to KRHA are now fully deductible as charitable contributions. The Kentucky Rural Health Association (KRHA) educates providers and consumers on rural health issues and advocates actions by private and public leaders to assure equitable access to health care for rural Kentuckians. It has sponsored conferences, discussions and workshops on current topics pertaining to rural health. Whether it provides Medicaid updates to rural members, works to recruit health professionals to rural areas, or sends representatives to meetings of the National Rural Health Association, the KRHA has been faithful to its two goals of educating members on rural health issues; and serving as an advocate for equitable access to health care for rural Kentucky. Whether you are a local official, clinician, teacher, or simply an interested citizen, you will benefit from joining and supporting the Kentucky Rural Health Association. The membership fee is modest, but the impact can be tremendous. As a KRHA member, you will have an opportunity to hear about why and how decisions affecting you are being made, and be able to express your opinion to the people who make those decisions. To donate to the Kentucky Rural Health Association you can visit www.kyrha.org/Donate. Kentucky Students in Rural Health! When Kentucky college students who have an interest in rural health return to campus this fall, many will have the opportunity to network with others who have similar interests. There are Student Rural Health Chapters on the campuses of Western Kentucky University, Asbury University and Alice Lloyd College. The South Central Kentucky Area Health Education Center (AHEC), along with Western Kentucky University, has offered the opportunity for students to be a part of a Student Rural Health Association at WKU since the spring of 2015, says WKU advisor Catherine Malin. Topics have included international healthcare, healthcare economics, oral health, and a health profession student panel. One of the main service projects, Malin says, is a food drive for the WKU food pantry. Another way that the SRHA has been active is by participating in a 2016 Really Rural video contest for National Rural Health Day, which they won! As a result, a WKU student got to attend the National Rural Health Association annual conference in San Diego, California. While the organization is open to all WKU students, most of the organization's member are pursuing a career in the health field. Ms. Malin listed pre-medicine, pre-physician assistant, nursing, healthcare administration and pre-physical therapy students as some of the past members. To start an SRHA at your college or university, contact Tina McCormick, KRHA Executive Director, at (270) 577-1707 or krha@twc.com. The Southern Kentucky Area Health Education Center and the Kentucky Rural Health Association welcome Anna Poynter as the 2017 Kentucky Rural Health Communications Intern. Poynter, who will graduate from the University of the Cumberlands in 2018, is a double major in communications and public health. The Centers for Disease Control defines health communication as "the study and use of communication strategies to inform and influence individual decisions that enhance health." Poynter will engage in a range of activities designed to promote health changes in individuals and rural communities, including message development, provider-patient communication studies, and the use of social and traditional media. The So KY AHEC/KRHA partnership means Poynter, who will work primarily out of the So. KY AHEC office at Rockcastle Regional Hospital in Mt. Vernon, will focus much of her work on the 15 counties of the So. KY AHEC region while also addressing issues that affect rural Kentuckians throughout the state. “We realize the importance of outreach to move this association forward,” said Tina McCormick, KRHA executive director. “I am thrilled to welcome Anna to our team as we work to improve the health of Kentuckians through education and advocacy. The So. KY AHEC created the internship in 2016 and seeks a new collaboration every year to assist with funding and direction. Last summer, the AHEC partnered with the Colon Cancer Prevention Project to create awareness of the need for colon cancer screenings. Intern Dalton Godbey, a communications major at Western Kentucky University, told the stories of colon cancer survivors throughout the region via newspaper articles and a video. The So. KY AHEC, one of eight regional AHECs throughout the state, focuses on improving the health of its 15-county region, from Madison County down to the Tennessee border, through education and workforce development. In addition to Continuing Education programs, the So. KY AHEC facilitates rural health professions student rotations, health careers promotion and education, health education, and community outreach. Poynter is no stranger to the AHECs, having been involved in multiple health career camps and other activities since she was in middle school. For more information about the So. KY AHEC’s Rural Health Communications internship, email dharris@soahec.org. The Kentucky Rural Health Association invites you to submit a proposal for concurrent sessions (panel, individual or group) for the Annual Conference scheduled for November 16-17, 2017 at the WKU Knicely Center in Bowling Green, KY. Please see the attached call for proposals instructions for more details on how to submit a proposal. The disclosure form is also attached and will need to be uploaded when completing the proposal within the survey tool. Should you have any questions please contact Kayla Combs. Greetings from the Governance Committee! Our charge is to “oversee issues concerning the infrastructure of the Association, such as amendments to the bylaws, modifications and additions to the Policy Manual, and leadership development.” This year’s team consists of seven highly-engaged members: Bryant Hileman, Susan Starling, David Bolt, Steve Fisher, Benjamin Minnis, Christine Romani, and chair Julian Cunningham. We are excited about our goals for 2016-2017! We began by organizing a Special Meeting of the KRHA membership, which allowed the general membership to vote on amending the Articles of Incorporation. The meeting was scheduled and occurred on January 18 in Louisville. The amendment passed unanimously, which will ultimately modify KRHA’s tax-exempt status to 501(c)(3). This modification will have huge financial implications for the Association going forward; we will now be qualified for monies that we were previously ineligible for. We look forward to helping KRHA be as effective and efficient as possible in assuring rural Kentuckians receive quality health care. If you have any questions or feedback, or if you would like to get involved, please contact Julian Cunningham at Julian.cunningham@uky.edu. Amid evidence of its rural, Appalachian students’ low application and matriculation rates to in-state medical schools, the Northeast Kentucky Area Health Education Center (NE KY AHEC) has developed two physician pipeline programs designed to produce more – and more competitive – regional applicants. Results from these efforts were recently published in a rural health-themed supplement to the Journal of Health Care for the Poor and Underserved in an article titled “Priming the Physician Pipeline: A Regional AHEC’s Use of In-state Medical School Data to Guide Its Health Careers Programming.” The article was authored by NE KY AHEC Director David A. Gross, Assistant Director Lainey Mattox, and Marketing Assistant Nicole Winkleman. As a result of the journal publication, STEPS also was recently featured on the federally funded Rural Health Information Hub’s Models and Innovations web page here. As a way to showcase the variety of KRHA members, we are pleased to introduce our New Member Spotlight as a component of our KRHA blog series! This edition’s New Member Spotlight is on Pain Management Group. Their diversely talented team works closely with partnering hospitals to organize pain as a service line and maximize hospital resources and services. PMG contracted physicians work with hospital clinical staff in a program that strengthens communities by helping patients return to work and a life uninhibited by pain. Why did you join KRHA? Christina Muryn, Business Development Manager, explains that as they seek to expand their partnerships, build more relationships within the industry, and identify significant areas for growth, joining KRHA was a great fit. The opportunity to network and get more involved in the area was a large reason for wanting to join. “We joined KRHA for a few different reasons, mostly to meet new hospitals and other partners. We look forward to sharing our quality programming with those we meet through this organization” said Muryn. Pain Management Group is also a Bronze Sponsor of the KRHA.